Hyundai HiS-S250MG(BK) 250 Watt Solar Panel Module – this is an independent review for the Hyundai HiS-S250MG(BK) 250 Watt Solar Panel Module we have compiled for your reference. Feel free to add your comments or experiences at the bottom of the page. Hyundai Heavy Industries was founded in 1972 and is a Fortune 500 company. The company employs more than 48,000 people, and has a global leading 7 business divisions with sales of 51.3 Billion USD in 2013. As one of our core businesses of the company, Hyundai Heavy Industries is committed to develop and invest heavily in the field of renewable energy. Hyundai Solar is the largest and the longest standing PV cell and module manufacturer in South Korea. We have 600 MW of module production capacity and provide high-quality solar PV products to more than 3,000 customers worldwide. We strive to achieve one of the most efficient PV modules by establishing an R&D laboratory and investing more than 20 Million USD on innovative technologies. The graph below shows the typical power produced (in Watts) for the Hyundai HiS-S250MG(BK) 250 Watt Solar Panel Module at maximum available sunlight (irradiance). The Hyundai HiS-S250MG(BK) 250 Watt Solar Panel Module has a maximum output of 250 watts. 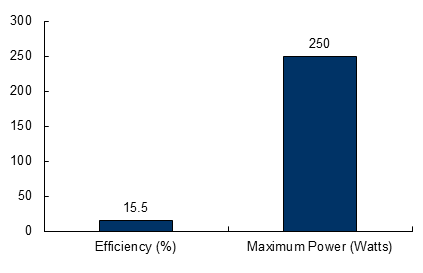 The graph below also shows the efficiency of Hyundai HiS-S250MG(BK) 250 Watt Solar Panel Module. Efficiency is an important thing to look at when comparing solar panels, since it affects how much power can be captured from the sun. The Hyundai HiS-S250MG(BK) 250 Watt Solar Panel Module has a module efficiency of 15.5%. Click the button below to add the Hyundai HiS-S250MG(BK) 250 Watt Solar Panel Module to your wish list.